In 1982, while Herb Alpert was south of the border creating FANDANGO with Jose Quintana, Lani Hall also did an album of songs by Juan Carlos Calderon, with both he and Quintana as co-producers. 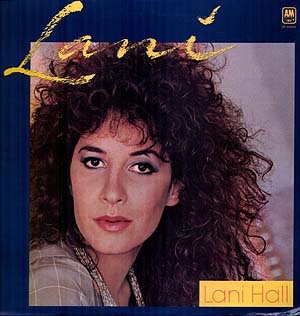 Called simply LANI, this eighth solo album would be one of the earliest releases in the AyM Discos line. This label was created for the vast Latin-American market both in the U.S. and elsewhere in the world. One of the first things that a non-Spanish-speaking Lani Hall fan might notice about this album is the almost-six minute Sergio Mendes medley on side two. A medley of some of the more-familiar Brasil ‘66 tunes, it provides something to grab onto while becoming familiar with the real treasures here, the rest of the album! Whether it’s the language, the songs, the production, everything here clicks and Lani is at her best. All of the material here is wonderful, thanks to the composing talents of Juan Carlos Calderon, and the execution of it is perfect. There are two vocal duets here, Lani with Jose Jose on “Te Quiero Asi” and with Juan Carlos Calderon himself on “Te Seguiré”. And Herb Alpert does his fabulous trumpet-thing on “Estare Enamorada?” Also present are some lovely ballads, “Tu, Solamente Tu,” “Se,” “Lluvia De Verano,” and “Si O No.” And then there’s the irresistible “Adios Tristeza” with its bouncy alliterative lyrics. This is an album not to be missed if you’ve ever enjoyed any of Lani Hall’s work.